Solar cells turn sunlight into electricity, but they're only about 20 percent efficient. Much of the leftover energy turns into heat, which actually harms the solar cell. 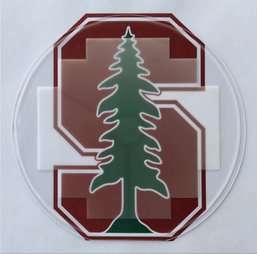 Now researchers from Stanford University, Palo Alto, California, USA, have developed and tested a new material that can cool a solar cell by up to 13° Celsius (C) under the California winter sun. Because heat makes solar cells less efficient, the researchers predict their cooling layer could help solar cells turn approximately 1 percent more sunlight into electricity, a big boost from a relatively simple add-on. The cooler temperatures also mean the solar cells will likely last longer due to greatly reduced efficiency degradation rates. The researchers will present their results at the Conference on Lasers and Electro-Optics (CLEO), which is held 5-10 June in San Jose, California. One way to keep objects cool in the sun is to reflect the light back into the atmosphere. This approach works for white cars and mirrored rooftops, but it wouldn't work for solar cells, which need to absorb as much light as possible to generate electricity. An alternative is to make it easier for heat to escape—an approach called radiative cooling. "What's unique about our work is that we demonstrate radiative cooling while preserving the amount of solar absorption," said Linxiao Zhu, a graduate student in the research group of electrical engineering professor Shanhui Fan. In other words, the new material keeps the solar cell cooler even as the solar cell absorbs the same amount of sunlight. The researchers achieved the combination of cooling plus maintaining sunlight absorption with a wafer made of silica, a colorless mineral found naturally as quartz. 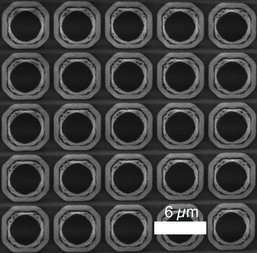 The researchers etched tapered holes, about 6 micrometers across and 10 micrometers deep, in the wafer. The holes are designed to smooth the path the thermal radiation takes to escape. The team tested the silica layer by placing it on top of a solar cell mimic—a polished silicon wafer with an antireflection surface and aluminum back that has similar absorption characteristics to standard solar cells, but wasn't actually wired to produce electricity. The testing verified that because the silica layer is transparent, approximately the same amount of sunlight still reaches the solar cell mimic. In fact, there was a slight increase in absorption because of anti-reflection and light trapping effects of the etched silica. The researchers also found that the etched silica layer lowered the temperature 13° C compared to the bare solar cell mimic. Cold solar cells function better than hot ones, so the cooler the better, Zhu said. The researchers estimate that the 13 degrees cooling would result in an absolute efficiency improvement of more than 1 percent. Aaswath Raman, a co-author of the study, also noted that heat can speed up the degradation of solar cell parts, so cooling could lengthen their lifespan and likely save costs. Ultimately, radiative cooling relies on the coldness of the universe, which is a mostly untapped thermodynamic resource, Zhu said. And solar cells aren't the only applications that could benefit from this cooling approach, especially since the new research shows it can work without significantly altering the sunlight absorption characteristics of an underlying material, Zhu said. Cooling cars, clothing, and outdoor equipment are all possible applications, he said. Maybe they are saying that they can etch tiny holes in the layer. Solar cells are normally encapsulated behind glass. Normal glass blocks long-wave IR (hence the 'hothouse effect') so this micro-structure would not work unless it was on top of the glass, rather than directly on the cell surface. If it is on the outside it will get wet and dirty. Is there something here that I don't understand? Every week happy new news about a breakthrough that leads to more efficient solar cells. And yet they still produce power that is horribly expensive. Also, a solar plant that can produce as much power as a nuclear plant would take up as much land as a medium sized city.